We have coached and played at all levels, up to and including OHL Junior A. We will strive for constant and never ending improvement within our programs to help players achieve their goals and enjoy this great game. This is where old fashioned work ethic meets cutting edge professional instruction and pure enjoyment enhancement of the game. With our coaching experience from pre tyke local league to O.H.L. Major Junior A, we understand the needs of all hockey players from every age group and level. 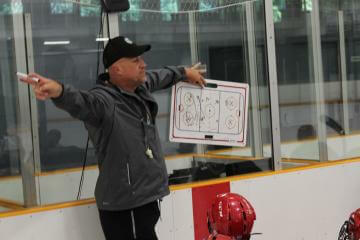 The game of hockey has evolved and the players, through individual and group teaching, will learn their “options” that can be used in game situations which will foster their creativity and improve their in game decision making abilities. Combined with explosive and elusive skating techniques and skill development, every player will be given the tools to improve and will be challenged in a fun and safe environment. Depending on the camp or clinic, our off ice activities will include professional yoga instruction, shooting lessons, stickhandling techniques, quick feet training, explosive speed training, flexibility, agility, and endurance. They will also include fun games that the kids will thoroughly enjoy. On ice training will include forward and backward explosive skating techniques, stickhandling with speed, elusive skating techniques, battling, shooting speed, shooting accuracy, offensive options, hockey sense enhancement, creating offense, puck movement, puck possession. Every player will also be held to a high standard of being a good team mate on and off the ice. To provide superior development on and off the ice while enhancing the pure enjoyment of the game for every player no matter their age or skill level. To train and select only the best instructors and leaders to mentor and teach players in a safe, fun, and bully free environment. All players will leave our clinics knowing what it means to be a good team mate. We want every player to improve, and enjoy our programs to the fullest. Don has coached over 20 teams and has volunteered thousands of hours over the past number of years. Don played for the Sault Ste Marie Greyhounds as an underage player and was named the youngest assistant captain in the O.H.L. the following season. During Don’s 4 years in the O.H.L. he was also a captain on the Niagara Falls Thunder and played for team Ontario’s Under 17 team. In the O.H.L coaches poll Don was voted by opposing coaches as the 2nd best Defensive Forward, 2nd best Penalty Killer, and 3rd best checker. Don won the “ Most Inspirational Player” award, “Most Improved Player” award and various O.H.L Plus / Minus Awards. Don had various professional tryout offers but opted to get his University Degree while playing for Wilfrid Laurier University where he was also a captain. Upon earning his degree Don once again had many professional hockey tryout offers and opted to try out for a farm team of the Florida Panthers and New York Islanders N.H.L. teams. Once Don returned back to Ontario he was offered a position as an Assistant Coach with the O.H.L Kitchener Rangers where he spent 3 seasons. Don has been a head instructor of many hockey clinics including being a guest instructor at former NHL player Todd Simons Hockey School. Don has coached many teams at various age groups and levels and has helped guide teams to various Provincial and Alliance Championships. Don has played for 4 N.H.L. Head Coaches, an OHL Coach of the year, a Memorial Cup Champion Coach, an AHL Champion coach, an NHL Coach of the Year, and spent 3 years coaching with an NHL Stanley Cup Champion Coach. "My old linemate Donny McConnell was an unbelievable teammate and one of my favourite guys to be around. He could play in all situations. He was best known for being a two way player, and could shut down the best players on the other team and often provide timely offense. Other teams would have to change their game plans around his incredible faceoff and checking abilities. Overshadowed by his defensive presence was his creative and clutch offensive skills. I am so pleased to learn that Donny has continued to stay in the game helping, teaching, and inspiring the next generations of hockey players. He is a student of the game and one of the best guys that I have had the pleasure to play with. Without a doubt, you and or your child will have a great experience being taught offensive and defensive skills by this great guy." – Brad May - 18 year NHL Player, Stanley Cup Champion, Team Canada World Junior Champion, owner of one of the most famous goals in NHL history – the “Mayday Goal”.